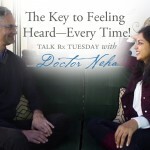 The Key to Feeling Heard—Every Time! Is LOVE Taking You For a Ride? Who Puts The Love In Your Lunch? Do You Say Yes When You Really Mean No?